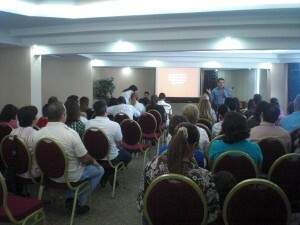 We’ve been working along side a pastor from Venezuela, here to raise a church. Readers of this blog have been following our journey for two years, though I’ve not strung the posts together to tell the whole story. This church plant is called a parachute drop. We’ve “dropped in” from the outside, observing the culture, dreaming about God’s plan for us, and building our social networks from scratch. We are working with immigrants from another country who moved here to work among fellow immigrants and locals. We are in a high density urban zone neighborhood of 65,000 people that has 7 churches, of which 6 are under 100 in size. Notice how many people that suggests do not attend church on Sunday (statistics here are hard to come by, particularly those that commute out of their neighborhood to other churches). Even if we could reach 1%, that’s still 650 people. We’ve had a few false starts, but have finally built a core group of about 13 families that has been meeting weekly in pastor’s apartment. We’ve been gathering for fellowship, fun, and some teaching. This core group has become our social network and emotional support system. 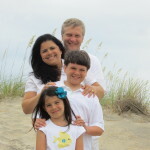 Along the way, we’ve had baptisms of new believers, and lots of active discipling. We are in a sense, training the future leaders of his congregation. We’ve given ourselves away in servant projects, retreats, and meeting each others needs as the Lord provides. We are doing this with no funding other than missionary support and tent making. For example, I sell my ebooks on church hospitality at my other website and get some income speaking at other churches.40 Your partnership with financial help through PRMI enables us to serve here as well. Our current reality is that pledged support each month and expected product sales is only at 40% of our need. We’ve still got a lot of fundraising and new product development to do. That core group of mostly new Christians met for over a year in an apartment. We stepped out in faith after one year and rented a hotel room for a Sunday. We paid for 30 people ($500 to rent). 75 people attended the first gathering a few weeks ago, way beyond our expectations. We’ve received almost enough provision to rent the hotel room again for our next service which will be June 20. It’s not easy work by any means. We’ve walked through seasons of stress like we never had before. But in the end, is it worth it? By all means. $500 provides rental of a hotel room for one service. Dowload the Donor Response form to print out and mail to PRMI, or work through the steps of donating on line. 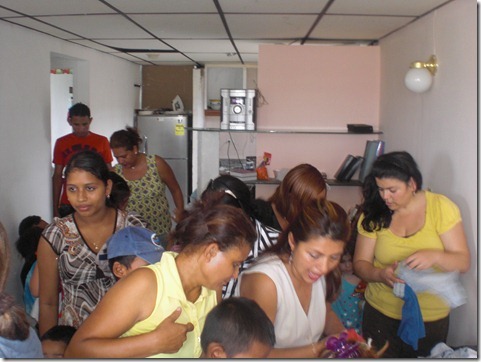 Two Sundays ago, Buenas Nuevas Panama took a Sunday to serve a local church in a servant evangelism project. We went out to a community near the airport, one that is known to be a dangerous and violent place, often drug related or gang violence. In fact, recent government statistics released yesterday indicate one homicide for every 10 hours. 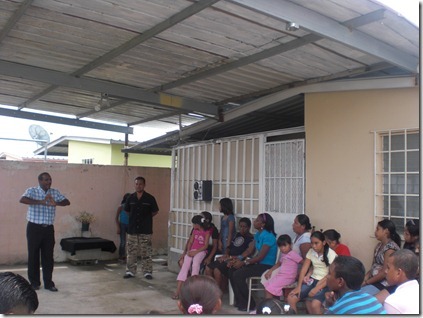 The church we served meets on the back patio of the pastor’s house. The tin roof provides a little shade from the hot sun, as people gather around to heard the word of God proclaimed. You can see the iron bars on the doors and windows. This is common on every house I’ve seen in Latin America. Like wise, this structure is still being renovated as the Lord provides the cash for the pastor to make renovations. They do not qualify for any kind of loan, nor are the offering sufficient. The pastor is an iron worker and has some work selling cast iron furniture frames. Recently, there has been a huge crisis in garbage collection in this city, and the result is, this community reeks of rotten garbage. If you’ve been to a landfill, you know the smell. Poor areas like this do not get the attention that the rich areas do. The rich areas have their garbage picked up daily! After the service, the distribution begins inside a living room that measures only 8 ft by 12 feet, nearly 25% of the 2 bedroom house. If you have participated in servant evangelism projects like this, you know the profound blessings and wonder that you feel as people express their appreciation for what you have just given them. our calling to serve and give ourselves away here. It was hard to fight the tears. I watched the drama called “Praying for you” set to a hip hop beat like this one, that highlighted a mother praying for her wayward children who were invovled in gangs. This was their reality in this little church. We were but a little light in a sea of chaos, crime, and gangs. We hope to continue to give ourselves away in this community. 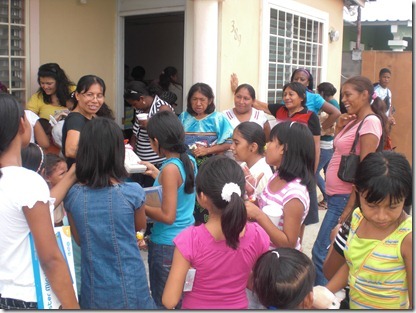 As Buenas Nuevas Panama launches this weekend, we hope to establish a church that has service to the poor as one of its DNA. It is truly more blessed to give than to receive. We’ve been praying for this event and eagerly excited to see what God will do with this new church development. Likewise, here is a video of his wife Marionee, sharing some of her story.